Effectiveness of combined physician and patient-level interventions for blood pressure (BP) control in low-income, hypertensive African Americans with multiple co-morbid conditions remains largely untested in community-based primary care practices. Demographic, clinical, psychosocial, and behavioral characteristics of participants in the Counseling African American to Control Hypertension (CAATCH) Trial are described. CAATCH evaluates the effectiveness of a multi-level, multi-component, evidence-based intervention compared with usual care (UC) in improving BP control among poorly controlled hypertensive African Americans who receive primary care in Community Health Centers (CHCs). Participants included 1,039 hypertensive African Americans receiving care in 30 CHCs in the New York Metropolitan area. Baseline data on participant demographic, clinical (e.g., BP, anti-hypertensive medications), psychosocial (e.g., depression, medication adherence, self-efficacy), and behavioral (e.g., exercise, diet) characteristics were gathered through direct observation, chart review, and interview. The sample was primarily female (71.6%), middle-aged (mean age = 56.9 ± 12.1 years), high school educated (62.4%), low-income (72.4% reporting less than $20,000/year income), and received Medicaid (35.9%) or Medicare (12.6%). Mean systolic and diastolic BP were 150.7 ± 16.7 mm Hg and 91.0 ± 10.6 mm Hg, respectively. Participants were prescribed an average of 2.5 ± 1.9 antihypertensive medications; 54.8% were on a diuretic; 33.8% were on a beta blocker; 41.9% were on calcium channel blockers; 64.8% were on angiotensin converting enzyme (ACE) inhibitors/angiotensin receptor blockers (ARBs). One-quarter (25.6%) of the sample had resistant hypertension; one-half (55.7%) reported medication non-adherence. Most (79.7%) reported one or more co-morbid medical conditions. The majority of the patients had a Charlson Co-morbidity score ≥ 2. Diabetes mellitus was common (35.8%), and moderate/severe depression was present in 16% of participants. Participants were sedentary (835.3 ± 1,644.2 Kcal burned per week), obese (59.7%), and had poor global physical health, poor eating habits, high health literacy, and good overall mental health. A majority of patients in the CAATCH trial exhibited adverse lifestyle behaviors, and had significant medical and psychosocial barriers to adequate BP control. Trial outcomes will shed light on the effectiveness of evidence-based interventions for BP control when implemented in real-world medical settings that serve high numbers of low-income hypertensive African-Americans with multiple co-morbidity and significant barriers to behavior change. Hypertension affects approximately 65 million adults in the United States , and disproportionately affects African Americans in terms of prevalence, treatment, and control rates compared to whites [2, 3]. These disparities may explain the poorer adverse hypertension-related outcomes in African Americans . The cardiovascular benefits of blood pressure (BP) control are well-documented , as are the utility of patient- and provider-centered interventions in promoting BP control [6–9]. Lifestyle interventions of reduced sodium intake [7, 10] and other dietary modifications (increased consumption of fiber, fruits, vegetables, and low fat dairy; reduced consumption of saturated and total fat) , and increased physical activity and weight loss  have resulted in significant BP reduction. While these interventions have proven efficacious in clinical trials, and although there are many community-based interventions that engage African Americans (and are often conducted in low-income communities), their effectiveness remains largely untested among hypertensive African Americans who receive care in low-resource settings such as Community Health Centers (CHCs). The Counseling African Americans to Control Hypertension (CAATCH) trial  was designed to evaluate, in a cluster randomized trial, the effectiveness of a multi-level, multi-component, evidence-based intervention compared to usual care (UC) in improving BP control in hypertensive African Americans who receive care in CHCs. The trial targets barriers to optimal hypertension control at the patient, provider, and practice levels in a large cohort of African American adults (n = 1,039) . As such, this trial has the potential to expand our understanding of barriers and facilitators of intervention implementation in 'real-world' clinical settings, as well as the effectiveness of lifestyle interventions in previously understudied and underserved populations. This paper describes the demographic, clinical, psychosocial, and behavioral characteristics of CAATCH trial participants in order to highlight some of the patient-related barriers to hypertension control present in this sample. A detailed description of the rationale, design, and methods of this trial has been published elsewhere . The study protocol was approved by the Institutional Review Boards (IRBs) of Columbia University, New York University, and Clinical Directors Network (CDN), and all participants provided informed consent to participate. 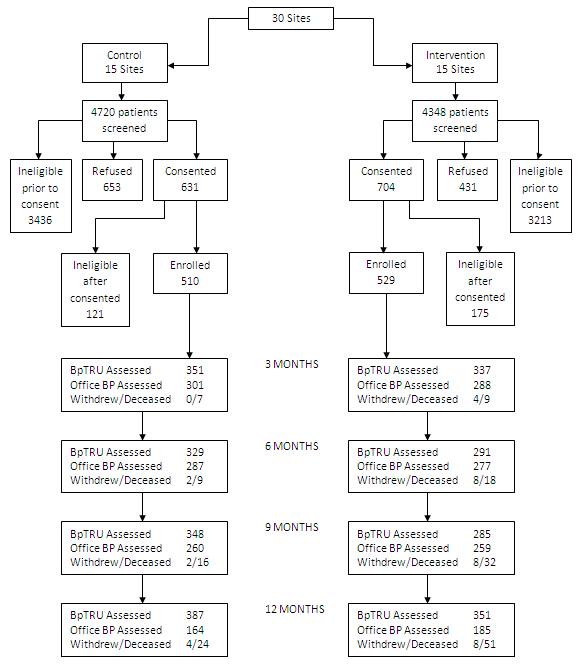 Briefly, CAATCH is a two-arm, cluster-randomized controlled trial (RCT) implemented in 30 CHCs, with 15 sites randomly assigned to the intervention condition (IC) and 15 to UC. The participants included 1,039 African American adult men and women. Patients were eligible for the study if they: self-identified as black or African American; were at least 18 years old, were receiving care at the participating CHC for at least six months prior to enrollment; had a diagnosis of hypertension (HTN), were taking at least one anti-hypertensive medication, and had uncontrolled BP at the time of enrollment based on standardized measurement at study visit (systolic BP (SBP) ≥ 140 mm Hg or diastolic BP (DBP) ≥ 90 mmHg; for those with diabetes or kidney disease, SBP ≥ 130 mm Hg or DBP ≥ 80 mm Hg). Additional details on inclusion and exclusion criteria have been published elsewhere . Figure 1 shows the flow of patients through the study in a CONSORT  diagram. The intervention was implemented at the practice level, such that all physicians and patients at a given site were in the same treatment condition: IC or UC. Within the IC sites, the CAATCH intervention is comprised of three components targeted at patients (interactive computerized hypertension education, home BP monitoring, and monthly behavioral counseling on lifestyle modification) and two components targeted at physicians (monthly CME-accredited case rounds based on JNC-7 guidelines , chart audit and provision of feedback on clinical performance, and patients' home BP readings). Additional details on the intervention and its delivery are described elsewhere . The goal of CAATCH was to evaluate, in cluster randomized trial, the effectiveness of a multi-level, multi-component, evidence-based intervention compared to UC in improving BP control among hypertensive African Americans who receive care in CHCs. We hypothesize that patients randomized to the IC will have, compared to those in the UC condition: a higher BP control rate at 12 months; greater reduction in both SBP and DBP at 12 months; and a higher rate of maintenance of intervention effect one year after completion of the trial. In addition, the IC will be more cost-effective in improving BP control rate at 12 months compared to UC. The primary outcome was the proportion of patients with adequate BP control at 12 months; and the maintenance of intervention effects one year after the trial. BP was defined as uncontrolled if the average BP ≥ 140 mm Hg or DBP ≥ 90 mm Hg (for those without comorbidity) OR average SBP ≥ 130 mm Hg or DBP ≥ 80 mm Hg (for those with diabetes or kidney disease). The secondary outcomes are within-patient change in BP from baseline to 12 months, and the cost effectiveness of intervention at 12 months. Data collection and study measurements were performed by trained research assistants (RAs) via interviews, direct measurements, and chart review. A complete listing of all measures and details of assessment protocol has been published elsewhere . At baseline, three BP readings were taken by trained RAs using a validated automated BP monitor (BPTru, Model BPM-300; BpTRU Medical Devices, Coquitlam, BC, Canada) with the patient seated comfortably and following American Heart Association (AHA) guidelines . The average of the three readings was used as the measure for baseline assessment. Psychosocial and behavioral characteristics were assessed with validated self-report measures and included medication adherence (4-item Morisky Scale) , self-efficacy (Medication Adherence Self-Efficacy Scale; MASES) , health literacy (Rapid Estimate of Adult Literacy in Medicine; REALM) , dietary intake (Rapid Eating Assessment for Patients; REAP) , physical activity (Paffenbarger Physical Activity Scale) , daytime sleepiness (Epworth Sleepiness Scale) , depression (Patient Health Questionnaire-9; PHQ-9) , and general physical and mental health (version one of the 12-Item Short Form Health Survey; SF-12) . At the CHC site level, data were gathered on whether CHCs utilized electronic health records (EHRs), and whether they were part of the Health Resources and Services Administration (HRSA) Health Disparities Collaboratives http://www.healthcarecommunities.org. The HRSA sponsored Health Disparities Collaboratives (HDCs) use the structure of the Chronic Care Model (CCM), which is an organizational approach to caring for people with chronic disease who are seen in a primary care setting. The system is population-based, and creates practical, supportive, evidence-based interactions between an informed, activated patient and a prepared, proactive practice team; it identifies six major categories that must be addressed to achieve substantial change, including the healthcare organization, community resources and policies, self-management support, decision support, delivery system design, and clinical information systems . The design for the CAATCH trial was based on power calculations for the proposed analysis of differential changes in office SBP and DBP between IC and UC sites (CHCs). These calculations were based on post-intervention data available from Phase one of the medication Adherence and Blood Pressure Control (ABC) trial, which was conducted by this research group in several of the same CHCs . BPs for those in the ABC trial home blood pressure monitoring (HBPM) intervention (n = 137) were compared to those in the UC group (n = 80) in nine sites, and office BPs decreased substantially in both conditions (SBP/DBP decreased 12.0/6.0 mmHg in HBPM versus 8.7/3.8 mmHg in UC). Of note, they decreased more (3.3/2.2 mmHg, p = 0.053/0.078) in the HBPM condition. Clustered sampling due to patients being nested within sites was controlled for, yielding estimates of the between-site and within-site variances in treatment effect (5.13 and 154.21 for SBP, and 1.72 and 86.35 for DBP). Sites were the primary unit of analysis, given that sites are randomized to treatment condition. To estimate the number of sites required, the within-treatment, between-site variance of site-level mean change scores was first estimated. This is estimated as the between-site (true) variance plus the sampling variability of the site mean. For SBP, this was 5.13 ± 154.21/Nsite, and for DBP it was 1.72 ± 86.35/Nsite, where Nsite is the number of patients per site. We initially planned for 30 patients per site, yielding variance estimates of 10.28 and 4.60 for site-level mean changes in SBP and DBP; taking square roots gives standard deviation estimates of 3.21 and 2.14. These estimates and the usual power calculations for a t-test were used to determine the number of sites needed to have adequate power to detect a specified effect size. With a total of 30 sites (with 30 patients at each site), 15 assigned to each condition (IC and UC), these estimates implied that there would be 80% and 81% power to detect SBP and DBP treatment effects equal to the HBPM effect reported above (using a 2-tailed, 0.05-level test). Because of the multifaceted nature of the intervention that was implemented in this study, it is reasonable to anticipate treatment effects of at least 4 mm Hg for SBP and 3 mm Hg for DBP. The estimated power to detect effects of this magnitude is 91% and 96%, respectively. Thus, based on this power analysis, we planned to randomize 30 sites (1:1). Because we anticipated approximately a 15% rate of attrition, the enrollment target was set at 1,058 patients from these sites, which would yield a final sample of 900 patients who complete the study (an average of 30 per site). The CAATCH trial has three nested levels of sampling: site, physician, and patient. Sites were matched for size (large/medium versus small), creating 15 matched pairs. Within each pair, one site was randomly assigned to IC and the other to UC. Due to a variety of unspecified factors, it was assumed that patients from the same site, and perhaps also patients having the same physician, would be somewhat more similar than randomly selected patients attending different CHCs or having different physicians. This implies correlated residuals due to 'clustered sampling,' that will be controlled in the primary outcome analysis by treating both CHC and clinician within CHC as random factors. Maximum likelihood estimates, approximate standard errors, and multi-level modeling statistical tests for primary outcome analysis will be obtained using PROC MIXED (SAS) [25, 26]. The comparison of treatment groups with respect to dichotomous or ordinal measures (e.g., gender or smoker) will be performed using the MIXOR software [27, 28], which estimates a logistic regression (with random effects). The clustered sampling effects associated with CHC and physician will be adjusted for in the equation. As appropriate, the model will be further augmented to include both person-level covariates (e.g., gender) and time-varying covariates (e.g., body mass index). As stated, the primary hypothesis concerns the treatment by time interaction. The 30 CHCs serve primarily low-income, African American populations. The median household yearly income in CHC zip codes was $32,499 (SD = $17,054) and mean percentage of African American adults in CHC zip codes was 53% (SD = 27%). A majority of the sites in the trial were located in metropolitan New York City (NYC) (73.30%), upstate New York (13.30%), and northern New Jersey (13.30%). The IC and UC sites were similar in characteristics (all p-values ≥ 0.05). The mean number of patients seen at the CHCs was 10,432 patients (SD = 13, 157) with 33.33% of sites classified as 'large' or 'extra large' CHC. Only a quarter of sites utilized EHRs, and less than one-half were participating in the HRSA Health Disparities Collaborative (see Table 1). Note. # Users = total number of patients across all divisions of care. HRSA = Health Resources and Services Administration. CAATCH clinicians (n = 94) were middle-aged (M = 47.0 ± 14.1 years); 57% female; 43% African American, 24% White, 9% Hispanic; 57% were U.S. Born; had MD/DO degree (75%); had worked in their CHC an average of 8.0 ± 6.5 years. There were an average of 4.4 clinicians per CHC. CAATCH participants were middle-aged (M = 56.9 ± 12.1 years), primarily female (71.6%), high-school educated (62.4%) and U.S. born (74.6%). Participants who were foreign-born had lived in the U.S. an average of 20 ± 12.4 years. One-half (54.0%) were insured through Medicaid and Medicare. As compared to UC, IC participants were more likely to be low-income (IC = 78.6% versus UC = 65.8%, p < 0.01) and have no health insurance (IC = 11.3% versus UC = 3.4%, p < 0.01; see Table 2). Baseline mean SBP and DBP were 150.7 ± 16.7 mm Hg and 91.0 ± 10.6 mm Hg, respectively. SBP was significantly higher in the UC group (152.1 ± 16.8) compared to the IC group (149.3 ± 16.5, p = 0.007). There were no between group differences for DBP. Resistant hypertension, defined as any patient taking at least three antihypertensive medications including a diuretic, was present among 25.6% of participants. Over one-half of the participants were obese, and an additional one-quarter was overweight. Most (79.7%) reported one or more co-morbid conditions, with over one-half (55.1%) reporting two or more, and a sample mean Charlson Comorbidity score of 2.5 ± 2.5. Diabetes mellitus was the most commonly reported co-morbid condition (35.8%), and congestive heart failure (CHF) was more common among UC (13.5%) than IC (7.5%) participants (p = 0.002; See Table 3). CAATCH participants were taking an average of 2.5 antihypertensive medications, with over one-third of the sample taking three or more medications. Over one-half of the participants were on a diuretic (alone or in combination with other drugs); the most common antihypertensive medication prescribed for patients in this study was ACE/ARBs with over two-thirds of the patients, and a little over one-half were prescribed diuretic alone on in combination with other drugs (see Table 4). Note. Data gathered through chart review. One-half of CAATCH participants reported medication non-adherence to their antihypertensive medication (55.7%), with a larger proportion of non-adherence in the UC group (63.1%) compared to the IC group (48.7%, p < 0.01). Self-efficacy for medication taking was lower in the UC group (M = 2.2 ± 0.6) than the IC group (M = 2.3 ± 0.6, p = 0.02). With regards to health literacy, a smaller proportion of UC participants (54.1%), compared to IC participants (60.8%) demonstrated high health literacy (61 to 66 points range) on the REALM, (p = 0.04). Differences in eating behaviors were also found between groups, with IC participants engaging in slightly less healthy eating (M = 1.7 ± 0.8) compared to UC participants (M = 1.9 ± 0.8, p = 0.006). Assessments of depression (PHQ-9), physical activity (Paffenbarger Physical Activity Scale) and general mental and physical functioning (SF-12) suggest that while mental health scores were generally within normal limits, on average, participants experienced some limitations in their physical functioning. The mean score on the Mental Component Summary (MCS) of the SF-12 was 48.0 ± 11.2. When comparing SF-12 MCS mean scores between groups, the UC group scored significantly lower (M = 47.1 ± 11.6) in overall mental health than the IC group (M = 48.7 ± 10.8, p = 0.03). Mean scores on PHQ-9 depression measure indicated that the UC group (M = 5.4 ± 4.7) scored in the mildly depressed range (PHQ-9 score ≥ 5)  and significantly higher than the IC group (M = 4.5 ± 4.6, p = 0.005). Approximately sixteen percent of the participants reached the cut-off for moderate/severe major depressive disorder (PHQ-9 score ≥ 10) . The Physical Component Summary (PCS) score of the SF-12 was 42.3 ± 10.4, and the UC group scored significantly lower (M = 41.6 ± 10.9) on the scale than the IC group (M = 43.0 ± 9.8, p = 0.04). Paffenbarger Physical Activity Scale mean scores indicated that CAATCH participants were sedentary, burning on average 835.3 ± 1,644.2 Kcal per week in physical activity. While sleep quality scores (M = 7.0 ± 4.7) fell within the Epworth Sleepiness Scale (ESS) normal range (0 to 9) [20, 29], one-fifth (20.9%) experienced problematic levels of daytime sleepiness, as indicated by scores of 10 or greater on the scale (see Table 5). In this paper we describe the baseline characteristics of African American patients enrolled in the CAATCH trial, a cluster RCT multi-level, practice-based, BP control trial among a sample of CHCs with a rich diversity of demographic, clinical, psychosocial, and behavioral characteristics. Results from this trial will provide valuable information on interventions to promote BP control in a high-risk population of hypertensive African Americans with uncontrolled BP. There were a number of patient-level barriers to hypertension control among the CAATCH sample at baseline, including low-income, significant co-morbidity, sedentary lifestyle, smoking, overweight, and obesity. This sample had a considerably lower mean income compared to patients in large-scale epidemiological studies, such as the multi-ethnic Dallas Heart Study [30, 31] and the Jackson Heart Study [32, 33]. When compared to other large-scale trials in hypertensive African Americans, CAATCH participants were more likely to be in particularly poor health. For example, CAATCH participants were heavier than those in the Dallas Heart Study , Jackson Heart Study , in Dietary Approaches to Stop Hypertension (DASH), Hypertension Improvement Project (HIP), and PREMIER trials [6, 11, 34]. Obesity rates reported for African Americans in the National Health and Nutrition Examination Survey (NHANES) were only 45% [35, 36], compared to over two-thirds reported in CAATCH. Similar to published data on medication adherence [15, 37–39], one-half of the CAATCH participants reported non-adherence, and they experienced diabetes and cardiovascular disease at rates higher than samples in large scale epidemiological trials such as the Jackson Heart Study . In fact, CAATCH participants reported higher co-morbid medical conditions, which are recognized as significant barriers to BP control . Physical activity levels in the CAATCH sample were very low, with most of the participants characterized as sedentary or insufficiently active. This a higher proportion than rates noted in the most recent NHANES data . A noteworthy finding is that prevalence of smoking in the CAATCH trial was higher than those in the Jackson Heart Study , the Dallas Heart Study , and recent NHANES data on smoking among overweight and obese adults . Further attention is warranted for several of the CAATCH sample's psychosocial and behavioral characteristics. CAATCH participants reported a moderate level of self-confidence in their ability to take antihypertensive medications (as measured by the MASES) , and a low level of healthy eating (as measured by the REAP) . While the average general mental health score (Mental Component Summary of the SF-12)  of participants fell within normal range of population based norms, the UC participants scored in the mildly depressed range (as assessed by the PHQ-921). Furthermore, participants reported limitations in general physical functioning (Physical Component Summary of the SF-12) . Though, on average, participants scored within the normal range on an index of sleep quality [20, 29], problematic levels of daytime sleepiness (Epworth Sleep Scale score ≥ 10) were present among one-fifth. This rate is higher than the prevalence of daytime somnolence observed in recent NHANES data , yet lower than rates found in a recent analysis from the Sleep Heart Health Study . The problematic daytime sleepiness observed in CAATCH participants may be due in part to the higher prevalence of obesity, which is a major risk factor for obstructive sleep apnea [44, 45]. One-quarter of CAATCH participants had resistant hypertension (defined as any patient with uncontrolled BP who is taking at least three antihypertensive medications, including a diuretic). While thiazide type diuretics are the recommended initial pharmacological treatment [5, 46], only one-half of the CAATCH sample had been prescribed one. However, this percentage is higher than the diuretic rate reported for a population of hypertensive patients from a large managed care organization, located in the southeastern United States, based on prescription fill data two years following publication of the JNC-7 guidelines . One of the most striking aspects of the CAATCH trial is how its participants compare demographically and clinically to large-scale efficacy trials of lifestyle modification on BP levels [6, 7, 11, 47], and four recently published effectiveness trials of BP control [34, 48–51]. Participation of African Americans in previous efficacy trials ranged from 25 to 50% of the sample [6, 7, 11, 34, 49, 51], while the CAATCH trial sample consists entirely of African American participants. Of particular note, the CAATCH trial represents a substantive improvement in African American male participation over previous trials in that almost one-third of participants were African American men. By contrast, one-tenth of participants in PREMIER were African American men. To our knowledge, the CAATCH trial includes the largest proportion of African American men in community practice-based trials. Because trust is a major hindrance to recruitment of minorities into clinical research , we adopted a two-pronged strategy to increase the participation of African American men, in addition to the traditional compensation provided to patients. First, we solicited the support of the CHC patient care coordinators and clerical staff in referring patients into the study. CHC staff typically interacts with patients over a longer period of time and have built significant rapport and trust with the patients, whereas research staff have a shorter duration and more circumscribed relationship with prospective study participations. Second, we asked the clinicians to refer their patients into the trial. This strategy also addresses the issue of trust, building on the existing relationships between patients and providers. In addition, we oversampled African American men, because women comprise 70% of the adult users of CHCs. Finally, we held series of educational sessions at the study sites to inform patients about the study and to identify and screen potentially eligible patients; refreshments were offered at these sessions. To our knowledge, CAATCH is the largest practice-based trial of patient and physician targeted interventions for BP control in hypertensive African Americans. We are only aware of three other trials that have targeted both patients and physicians in practice-based settings [34, 49, 50]. The first is the HIP trial , which is a nested, 2 × 2 RCT comparing physician intervention, patient intervention, and both combined versus control condition, among 574 hypertensive patients in eight primary care practices (32 physicians) in central North Carolina. The second is the Veterans Study to Improve the Control of Hypertension (V-STITCH) trial , which is a 2-level (primary care provider and patient) cluster RCT among 588 hypertensive patients in a Veterans Affairs Medical Center primary care clinic (17 physicians) in North Carolina. The third is a study by Roumie et al., which is a cluster RCT  that evaluated the impact of three quality improvement interventions (provider education, provider education and alert, patient education) of increasing intensity among 1,341 hypertensive patients who received care in two hospital-based and eight community-based outpatient clinics (182 providers) in the Veterans Affairs Tennessee Valley Healthcare System. One qualitative difference between CAATCH and these trials is that CAATCH was focused exclusively on African Americans. Second, the patients in CAATCH all had uncontrolled hypertension and greater co-morbidity than those in the other practice-based trials. Specifically, CAATCH participants had higher baseline BP, were more sedentary, had greater levels of co-morbidity, and higher current smoking rates than participants in the V-STITCH and HIP trials [34, 49]. Furthermore, CAATCH participants had comparable rates of smoking and higher rates of diabetes, and lower rates of medication adherence than participants in Roumie et al. VA-based trial of interventions targeting providers and patients . Perhaps of even more interest, participants in the CAATCH trial had lower income than those in the HIP, V-STITCH, DASH, and PREMIER trials, had less education than participants in DASH, and PREMIER, and as a group, were more likely to be underinsured. Thus, the patient population in CAATCH is more representative of low-income African Americans with poorly controlled hypertension and numerous adverse lifestyle behaviors and clinical characteristics that constitute barriers to adequate BP control. As such, the findings from CAATCH will provide needed information on effectiveness of lifestyle and self-management approaches in care of this high-risk population in a more generalizable context. Furthermore, the participating CHCs are distributed widely across upstate New York, four boroughs of New York City, Northern New Jersey, and serve low-income, African American patient populations. Utilization of EHRs among the participating sites at the time of recruitment and intervention was relatively low, and approximately one-half of the CHCs participating in the trial were involved in the HRSA Health Disparities Collaborative, an initiative that focuses on improving access to quality healthcare and improved health outcomes among medically underserved in order to reduce or eliminate health disparities . Several strengths of the CAATCH trial deserve consideration. The first is that CAATCH is an evidence-based multi-level intervention in a very large exclusively African American practice-based sample, in contrast to previous efficacy and recent effectiveness trials in which the rate of African American participation has been more modest [6, 7, 11, 34, 48, 54]. Second, CAATCH inclusion criteria allowed for the participation of patients with uncontrolled BP and those taking multiple medications, while the exclusion criteria of previous efficacy studies [6, 7, 11] were more conservative by comparison. Third, CAATCH joins a small number of effectiveness trials (implemented in the VA  or community based primary care clinics ) in efforts to deliver efficacious treatments in real-world primary care settings. CAATCH is one of few studies to address barriers to BP control in this patient population by evaluating the effectiveness of a practice-based intervention targeted at patients (home BP monitoring, lifestyle intervention plus patient education) and physicians (chart audit and feedback plus physician education). Thus, findings from this trial will extend our understanding of applicability and impact of a multi-level intervention in a population whose hypertension may be particularly difficult to control. We should note the following limitations of the CAATCH trial. First, similar to other large scale RCTs in African Americans, majority of CAATCH participants were women, making the results less generalizable to African American men. Second, there were imbalances in several important baseline patient characteristics between the IC and UC study sites, which raises potential threats to internal validity of the study findings. The cluster randomized design of the study sought to minimize baseline differences between both groups via matching of CHCs based on practice size. The reason for the observed baseline differences is not clear. One potential explanation for this imbalance may be the small number of sites that were randomized rather than the number of participants. Although the intraclass correlation coefficient (ICC) between the sites on these variables was quite small [24, 55], the additional matching of sites by size may have required larger number of sites than the proposed 30 sites. Alternative approaches to mitigate this problem maybe the use of a factorial design with randomization at the level of the providers on characteristics, such as number of years practicing in a community-based setting, size of caseload, and number of hypertensive patients in current caseload. This is the approach adopted by Corsino et al. , which often requires matching on lesser number of variables than sites and manageable number of providers and patients needed for the study. Other approaches of randomizing at the patient level with matching may also mitigate this problem, but such an approach is limited by the potential for contamination that is often a problematic in practice-based trials using such design, and the loss of the ability to examine the contribution of matching variables to changes in study outcomes. In summary, the demographic and clinical composition of the CAATCH trial participants represents an important contribution to the literature on interventions targeted at poor BP control in a high-risk population. Namely, the trial includes implementation of a multi-level, evidence-based, intervention in a real-world setting among participants who experience multiple demographic, clinical, psychosocial, and behavioral barriers to hypertension control. Findings from this trial have important implications for dissemination and implementation. First, successful conduct of this study will be an indication that complex multi-level intervention can be integrated into care of high-risk hypertensive African Americans who receive care in CHCs. Second, imbalance noted in the baseline data indicates that investigators considering cluster RCT design in this patient population should strongly consider enrolling a larger number of sites and possibly an alternative design with randomization at the provider level. Third, recruitment of this high-risk patient population was achieved with significant cooperation from the clinical and administrative staff at the participating CHCs. A major lesson learned in this regard is the underlying assumption that all CHCs do not operate in the same manner. While their payment structure may be similar, the staffing in these sites is quite varied in terms of the use of allied health providers and availability of health educators who can provide lifestyle counseling and patient education. Furthermore, the level of enthusiasm for pragmatic trials is quite different for each CHC, with some having more research experience and others lacking experience. This factor affected recruitment rates, follow-up rates, and delivery of the intervention. Specifically, sites that were more research-friendly had the highest completion rates with easier delivery of the intervention. Future practice-based research should better characterize the research sites along these dimensions in order to facilitate implementation of such complex studies and to assess the interaction between aspects of study implementation and CHC trial characteristics. Fourth, implementation of the patient level component of the intervention, including lifestyle counseling, could be strengthened by a flexible delivery format. For example, we found that a combination of in-person intervention sessions coupled with telephone check-in or booster sessions to support patient up-take of new skills allowed us to improve treatment fidelity levels. The CAATCH trial is the first of its kind to focus on the effectiveness of a multi-level intervention for BP control in a large, socio-demographically and clinically diverse sample of hypertensive African American patients receiving primary care in safety-net settings. Given characteristics of the CHCs and participants, CAATCH has the potential to extend our understanding of barriers and facilitators of BP control in a group that experiences significant hypertension-related morbidity and mortality. This study was supported by the National Heart, Lung, and Blood Institute (NHLBI) grant number R01 HL78566 (PI: Ogedegbe), National Institutes of Health (NIH), Bethesda, MD, USA. Dr. Fernandez was supported by an American Heart Association (AHA) Heritage Affiliate Clinically Applied Research Grant; the NIH Loan Repayment Program (LRP) in Health Disparities Research. Dr. Ogedegbe was supported by a grant from the National Center for Minority Health and Health Disparities (NCMHD, Program Project # 2P60 MD000206), NIH, Bethesda, MD, USA. The contents of this paper are solely the responsibility of the authors and do not necessarily represent the official views of the NHLBI, NCMHD, NIH LRP, or AHA. The funding agencies did not play a role in the study design; collection, analysis, and interpretation of data; the preparation of the manuscript; the decision to submit the manuscript for publication. We wish to acknowledge the significant efforts of the participating CHCs, clinicians and other staff, NYU and CDN Research Assistants. We express our gratitude for the time and effort of all of the study participants, without whom this study would not have been possible. Participating CHCs included Bedford Stuyvesant Family Health Center - Brooklyn, NY; Betances Health Unit, NY, NY; Brookdale Hospital - Linden Boulevard Practice, Brooklyn, NY; Brookdale Hospital - New Lots Practice, Brooklyn, NY; Brookdale Hospital - Urban Strategies Practice, Brooklyn, NY; Brownsville Multi-Service Family Health Center, Brooklyn, NY; Caribbean American Family Health Center, Brooklyn, NY; CitiCare Inc., NY, NY; Community Health Care Network - Caribbean House, Brooklyn, NY; Community Health Care Network - Helen B. Atkinson Center, NY, NY; Community Health Care Network - Betty Shabaaz CHC, Brooklyn NY; Flatbush Avenue Health Center of Brookdale Hospital, Brooklyn, NY; Greenburgh Health Center, Inc., White Plains, NY; Heritage Health Care Center, New York, NY; Hudson River Health Center, Peekskill, NY; Joseph P. Addabbo Health Center - Central Avenue, Far Rockaway, NY; Joseph P. Addabbo Health Center, Jamaica, NY; Manhattan Physicians Group, 95th Street, NY, NY; Manhattan Physicians Group, New York, NY; Manhattan Physicians Group, Washington Heights, New York, NY; Metropolitan Family Health Network, Jersey City, NJ; Morris Heights Health Center, Bronx, NY; Mount Vernon Health Center, Mount Vernon, NY; Newark Community Health Center at Ludlow, Newark, NJ; Newark Community Health Center, Newark, NJ; Ossining Open Door Health Center, Ossining, NY; Plainfield Neighborhood Health Center, Plainfield, NJ; Soundview Health Center - Delaney Sisters, Bronx, NY; Soundview Health Center, Bronx, NY; Urban Health Plan, Bronx, NY. SF participated in the design, coordination and analysis of the study. AC, MDG, and CK participated in the coordination of the study. GO and JNT conceived of the study and participated in the design, coordination, and analysis of the study. All authors contributed to the preparation of the manuscript, and read and approved the final manuscript.